Along with, “Do not be afraid,” this seems to be one of the most common admonitions in the Bible. In one way or the other, God is telling people don’t worry, don’t be afraid for tomorrow, all the time, it seems. So, why does God keep repeating Himself? Because, it seems, worry and fear are endemic to the human condition. In fact, worry and fear aren’t altogether unwarranted. One reason for that: There are so many things that can and do go wrong in the world. At root, every one of us is a control freak. We want things to go our way. We want them to go the way we think is right. We worry when we think they mightn’t go the ways we want to them to go. Instead, Jesus gives us a reason for not worrying: God has everything under control. Even when things seem out of hand. God is still in control. And God knows our every need and will provide for every need, even our need to forgive each other, to love each other, to work together to build a common life rooted in Christ, and to buck each other up with hope of eternity and with the certainty that our lives have value because Christ, God in the flesh, died and rose for us; that He is with us always, even in the most difficult places; and that He has created marriage to be a haven and a community of peace, of shalom, for a man and a woman, giving them a taste of that perfect peace and community that Christ will give His people in eternity. So, Chris and Christina, know today that if you build your life on the God Who revealed Himself to Israel and, fully and definitively, in Jesus Christ, adversities will come. Tough decisions will need to be made. After all, this isn’t heaven. But when you build on Christ, you needn’t worry. God has things in hand. He will hold you in His hand. And, as you both commit yourselves to Christ and one another, He will renew the joy you have in each other again and again. Things that caught my eye this past week. ...and the woman who's been through a lot who keeps it going. Be sure to read the article and watch the accompanying video. ...but this lengthy piece gives five plausible explanations as to why the world's largest theme park is abandoned. ...is free speech taking a hit on America's campuses? I remember reading Charlie Chaplin's autobiography many years ago. Included was a picture of him dressed as his famous Tramp character, standing on an incomplete movie set, with a caption that said something like, "Building a set without an idea in my head." Chaplin improvised his way through what became a classic. Chaplin didn't always create like this, as the meticulous scripts for some of his talkies show. The fact that Chaplin was capable both of improvising like a jazz musician or meticulously planning his work testifies to his greatness as an artist. He could do it all, including musical composition. 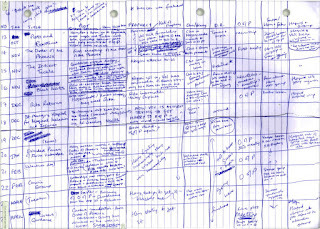 This article from Open Culture shows us the elaborate outlines of J.K, Rowling for a portion of her fifth Harry Potter book. 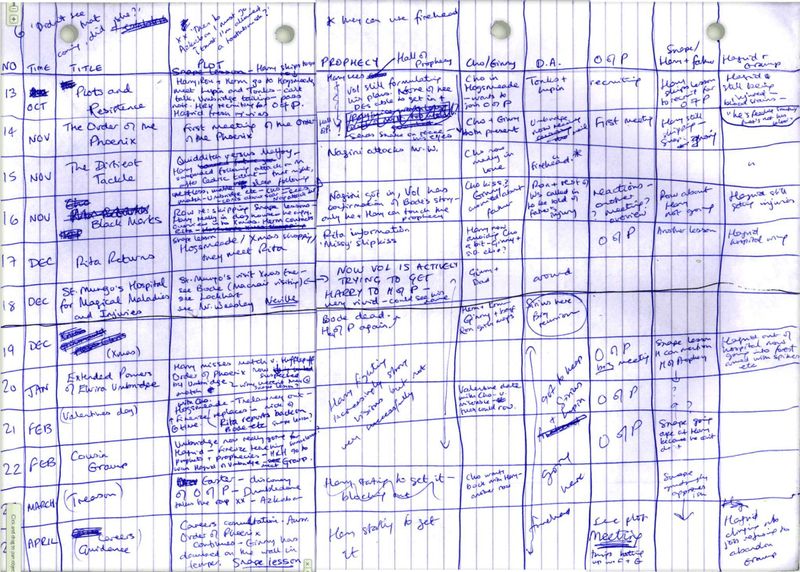 The moral: Compelling art is the result of careful planning. Except when it isn't. ...and that's how much of our money that the Defense Department can't account for since 1996. With Murray Blum, it makes you wonder, "Who does these books?" Here's what I'm pondering today. The LG part of LGBT wants to convince us that God doesn't make mistakes, that they are simply expressing the way God has created them. The T part of LGBT wants to convince us that God has made a mistake, and it needs to be fixed - NOW. Hmmm. Your thoughts? The subject of this picture came up at our church's Bible study on Tuesday. The picture appeared on Facebook on Thursday. The saying on the poster is a good antidote to one of the stupid, unbiblical things that people say at funeral visitations. You know the one I mean. 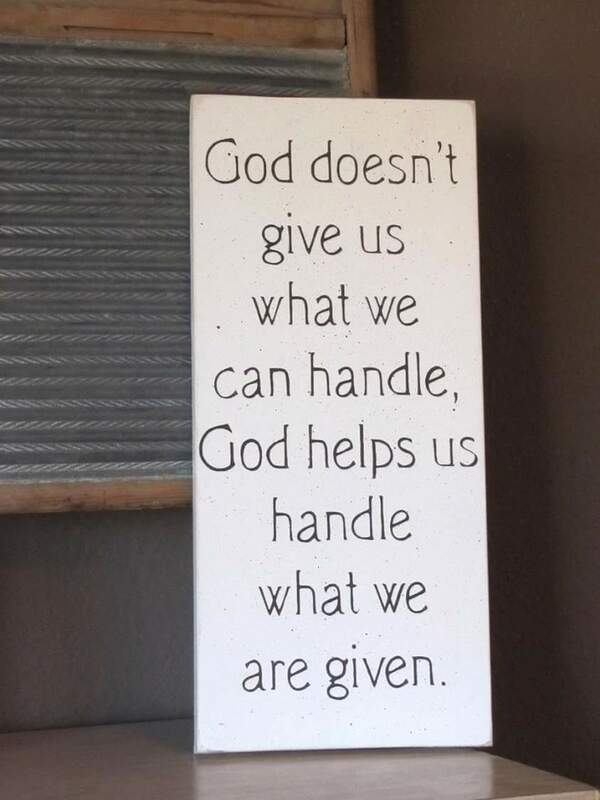 People say, "God doesn't give you more than you can handle." What a lot of rot! God isn't sitting in heaven figuring the amount of burdens and griefs He knows that we can bear, then dolloping them out to us accordingly. Griefs and burdens come to us because this is a fallen and imperfect world. This isn't heaven. God doesn't like the burdens of sin and grief and death we have. That's why He came into the world in Christ to defeat and destroy the power of sin and evil over those who trust in Christ. But, in this world, we still will grieve and suffer and die. So, until we die, we remain susceptible to the pains and griefs of this world. And we die. But, God's Word tells us that "...the wages of sin is death, but the gift of God is eternal life in Christ Jesus our Lord" (Romans 6:23). Hope for an eternal life free from death and strength for this life come as free gifts to all who repent and believe in Christ. God doesn't give you the things you have to bear. It's living in this world that does that and there is no limit to what suffering might come to you or to any of us. No one is exempt. However much suffering this world brings to us, if we take the scarred hand of Jesus, God will help us bear it, and eventually, into the resurrection living Christ has secured for His people. [UPDATE, a further thought: The apostle Paul does write in 1 Corinthians 10:13, "No temptation has overtaken you except what is common to mankind. And God is faithful; he will not let you be tempted beyond what you can bear. But when you are tempted, he will also provide a way out so that you can endure it." This may be where the "God won't give you more than you can bear" nonsense started. Here, Paul is addressing temptation, tests of one's faith, which may be rooted in our own desires or in suffering. But, in either case, Paul is talking about the temptation that may come in any situation to abandon trust in the God we know in Christ. When such temptation happens, Paul says, God will not let you be tempted beyond your capacity to endure, as you rely on Christ. And, this is the part I love, he says that God will give escape hatches for those tempted to abandon the faith. This text differs from the common funeral home saying too, because temptation, the subject of the 1 Corinthians passage, does not come from God, any more than suffering does. James 1:13-14 teaches us: "When tempted, no one should say, “God is tempting me.” For God cannot be tempted by evil, nor does he tempt anyone; but each person is tempted when they are dragged away by their own evil desire and enticed." 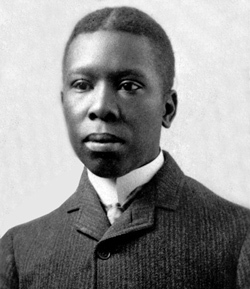 Paul Laurence Dunbar was a major American poet, African-American, who was born and raised in Dayton, Ohio. He was a high school classmate and friend of Orville Wright. Wright, with his brother, Wilbur, of course, invented the first functional airplane. There was a lot of intellectual candle-power in Orville's and Paul's class! Dunbar was married to poet Alice Moore. Tragically, Dunbar died of tuberculosis at the age of 34. This poem is poignant, beautiful, sad, and true all at the same time. It suggests that the greatest tragedy of life is to come close to that "perfect love," the kind "which lays aside its vanity and gives...truth." But deeper griefs than these beset the way. The pale, sad staring of Life's Tragedy. And gives, for thy trusting worship, truth. But by what kept us from that perfect thing. The 50 best restaurants in the world? Who killed Contemporary Christian Music? This article, from the mainstream news magazine, 'The Week,' grapples with a a question I care about as a Christian and as a lover of music. What we got from the great CCM of the late-80s and 90s was an honest form of witness and dialogue from artists like dcTalk, Switchfoot, Caedmon's Call, Rich Mullins, Steve Taylor, and others. As the article points out, rapper Lecrae, a great artist, fits that bill today. (Taylor also produced a new album last year and I love what Peter Furler, former lead singer of the Newsboys, is doing these days.) But when you listen to Christian radio stations today, the music is mostly worship and praise, some of it very good, but little of it designed to connect with unbelievers or to help believers wrestle with the sorts of issues that even believers like Job and Paul faced. I mourn, if not the total loss, the near pulseless and sanitized soullessness of a contemporary Christian music scene that allows for little honesty or artistic daring. Christian witness would be strengthened if things weren't as "cleaned up" as they are these days in CCM. This is the first draft of a welcome that appeared in today's Holy Trinity worship bulletin. Today is Holy Trinity Sunday. Its emphasis is on the mystery of God’s identity: one God in three Persons, God the Father, God the Son, and God the Holy Spirit. Although the Bible never uses the term trinity, the word summarizes a reality that is pointed to all over the pages of the Bible. There, we see the chronicles of the encounters of thousands of people with the three Persons of the Trinity? And what difference does it make that God is one God in three Persons? 1 John 4:8 tells us that, “God is love” (1 John 4:8). The writer of this phrase, John, was the same writer to affirm that God existed before time and creation and that God created the universe and us for no other reason than extravagant, self-giving love. This same John bears witness to having seen Jesus, God the Son, in the flesh, Who, in character, acted from extravagant, self-giving love. To say that, “God is love” isn’t to identify God as an abstract concept, love. It means that love describes the very essence and character of His being. It means that love is how God thinks, acts, creates, commands, forgives, renews, and seeks relationship. This is real-life love, not just theoretical love. And real life love is only identifiable, confirmable in relationship. From before the beginning, God has been in a loving relationship within Himself: the Father loves the Son and the Holy Spirit; the Son loves the Father and the Holy Spirit; the Holy Spirit loves the Father and the Son. The three Persons of the trinity are co-equal and one being. God gave and received love long before He breathed life into dust to make Adam. In fact, God only could only have loved the universe into being because His character was love. And that love already existed in the Trinity, in the real-life experience of eternal love. From the extravagance of God’s love, He has created You; He has entered the world to die and rise, offering forgiveness of sins, eternal life with God, and true loving fellowship with others, to all who repent for sin and believe in Jesus Christ; and He lives in and empowers the everyday lives of believers in Jesus. This is the reason why Jesus commands us, who make up His Church, to baptize “in the name of the Father, and of the Son, and of the Holy Spirit” (Matthew 28:19-20). God, the Trinity, wants His Church to proclaim the good news about Jesus, so that all, by grace through faith in Christ, can be part of the community of love He has enjoyed and will enjoy for all eternity. That’s how much He loves humanity. And that’s why the Trinity is so important. It was a Friday afternoon in the middle of the summer nearly thirty years ago. I was then the pastor of Bethlehem Lutheran Church near Okolona, Ohio. I was looking forward to going home, getting a bite to eat, and then doing some hospital visits before returning home to finish getting ready for Sunday morning. The church telephone rang. “Hello,” the voice at the other end of the line said. “Is this the pastor?” After I told the enthusiastic-sounding man that I was, he began, “You don’t know me. But, my name is Joe Smith [not his real name]. I used to go to that church when I was a little boy and my ancestors were among the founding members there.” “I see,” I said, wondering what this guy had up his sleeve. Joe Smith spoke these words as though he was announcing that Bethlehem and I had won the lottery! Just imagine it, he seemed to be saying, of all the churches and pastors in the world, you are the ones privileged to have our wedding. I tried to contain my enthusiasm and asked Joe Smith, “When would you and your fiancé like to be married?” “Tomorrow!” he said. When I explained to Joe that that wouldn’t be possible and that I didn’t know of any responsible pastor who would perform their wedding on such short notice, he was shocked. He, after all, was Joe Smith, descendant of a founding family of the parish! Nicodemus truly did enjoy the sort of high status among religious folks that Joe Smith thought he could expect from the pastor and people of Bethlehem Lutheran Church at Okolona, Ohio when he called me on that summer Friday afternoon. But, when Nicodemus comes to converse with Jesus, amazingly seeming to treat Jesus as his equal, the carpenter’s son from Nazareth delivers essentially the same message that He’s been delivering to all who hang on His every word. “Very truly I tell you, no one can see the kingdom of God unless they are born again,” Jesus says. “There are no privileged characters in the kingdom of God,” Jesus was saying. Or to put it another way, "Everyone is a privileged character in the kingdom of God, all equally so." So, first point of this message: We all need the new life God gives through Jesus. Every single person is a sinner. And every Christian is a sinner given a new life by God. This message from Jesus had to have been jarring, maybe even a bit insulting, for Nicodemus. Jesus seemed to be telling him that he wasn’t such a privileged character, after all. Even he needed to exchange his old life of sin and selfishness and presumption, to embrace one simple title, the one that every Christian receives from God above in the waters of Holy Baptism: Child of God. Nicodemus, this prominent, powerful teacher and ruler of the Jews, probably may not have been sure that he wanted to become a child of God. He was probably content, as all of us can be after we've moved out of the house and started lives of our own, with being a grown-up who got to do whatever he wanted. And he couldn’t have been too keen on the notion that he, just like all the other sinners Jesus interacted with each day, needed to get a new life. More than anything, probably, Nicodemus didn’t want to accept God’s new life as a free gift. Years ago, when our son was about ten years old, we'd just had a worship service at the church in Cincinnati. There had been about forty people there. On the way home, Philip and I passed several restaurants whose parking lots were packed. "That's the problem, Dad," he said. "The restaurants are selling every thing and you're giving it away." Fact is, it's human nature to try to attain things by our own efforts or even thievery rather than be humbled at having to accept a gift we didn't get by our own devices, brawn, brains, or shrewdness. It goes against the grain for all of us. We’d like to think that we deserve the riches of heaven, as well as the accolades of others. Back in our Bethlehem days, we had a five-week Bible and Catechism school for the eighty-five young people in the third through eighth grades. It was part of their Catechism training, which included weekly school-year Catechism classes for the sixth through eighth graders. We had the kids for chunks of whole days. So, we would have break period when we played kickball, softball, and other games. One kid, who later played college football was frustrated by this system. "How will we know who the winner is?" he asked. "We won't," I told him. "Oh." Under this topsy turvy bracketology, the losers wore the crown, the unworthy ones were the champions, and the kids who couldn’t run, jump, throw, or keep up with others were the winners, the ones who didn't earn the laurels got them. Just like the kingdom of God that belongs not to those who earn it or deserve it, but to all with faith in Jesus! And he’s right. Jesus belongs to those willing to lose control over their lives and lose their sin and lose death. If you’re like Joe Smith or Nicodemus, certain that God is privileged to have you on His team, certain that you’ve got a handle on righteousness, there’s no place for you in the kingdom of God. And if you are part of Christ’s eternal Church, you know that you can’t take credit for it at all. It really is a gift! Every time a person is baptized, whatever their age, born from above, and every time a person renews their faith through daily confession of sin and profession of faith in Jesus’ name, the Holy Trinity is at work to give them new life. God the Holy Spirit preaches the Word about Jesus to us through the Bible, fellow believers, and even preachers so that we can grasp the gifts of forgiveness and salvation God offers us for free. This is all God’s doing. When, at the initiative of the Father, through the action of Jesus on the cross and at the tomb, and by the power of the Holy Spirit, we believe and believe again, God gives us new birth, new life. That word that we translate as believes can be more literally rendered as, is believing. The tense in the Greek is more complicated than our present tense in English. It denotes continuous action. Belief isn't static, but keeps being renewed. The idea is that the believer is trusting God, not just because she or he was baptized or confirmed or had a warm. fuzzy feeling back in the day, but because they’re actively trusting Jesus Christ today, in this moment. Jesus is their Lord now and they are trusting Jesus moment to moment. They keep surrendering to Jesus every day and they know that they have to keep surrendering to Him, lest the devil, the world, or their sinful selves take control of their minds, hearts, and lives. Of course, because new and renewing life from God is a gift over which we have no control, we can’t decide to be born again. But we can, like a child about to be born who has no control over the contractions that will happen in labor, respond to the promptings that position us to be born anew. Point three: We need to keep being born from above. 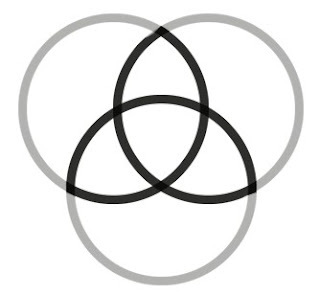 Three points about the Three-in-One God on this Holy Trinity Sunday. Point one: There are no privileged characters in the kingdom of God. We all need the new life God the Father gives through Jesus, God the Son. Point three: We need to keep being born above, letting the Savior Who put religious teachers in their places and Who accepted even prostitutes and extortionists, put us in our places in His kingdom. We need to let Him accept us and make us His forever. Let God--Father, Son, and Holy Spirit--give you new life every single day and in eternity. Amen! *It’s when one or both marital partners lose this appreciation of the giftedness of marriage, when one or both take the other for granted, that pain happens in marriages and when they are ripe for trouble, by the way. But that's another sermon.